The reform was initiated as a response to the current monetary conditions that had created a fixed market run by the government and a free market in which goods were 8 times as expensive but of better quality (wikipedia). At the same time, postal rates were all adjusted at a rate of 5:1 (in reverse), or, in other words, under the new currency, the face value postage rate was 1/5th of the previous rate. In other words: Between June 1st and June 19th (when new stamps were issued) in order to send a local letter. You would have to affix 20Kcs of stamps to the letter. 20Kcs in the old currency was equivalent to 40h (new letter rate) in the new currency. As you can imagine, this rate change created a lot of confusion, and, there are many interesting covers that appeared during the transition time from June 1st through June 18th. I became interested in this currency reform after posting a question related to a cover I have in my collection to Stamp Boards (See Post) Member Florian provided some insight into my cover and information on the currency reform that occurred in 1953. 3. 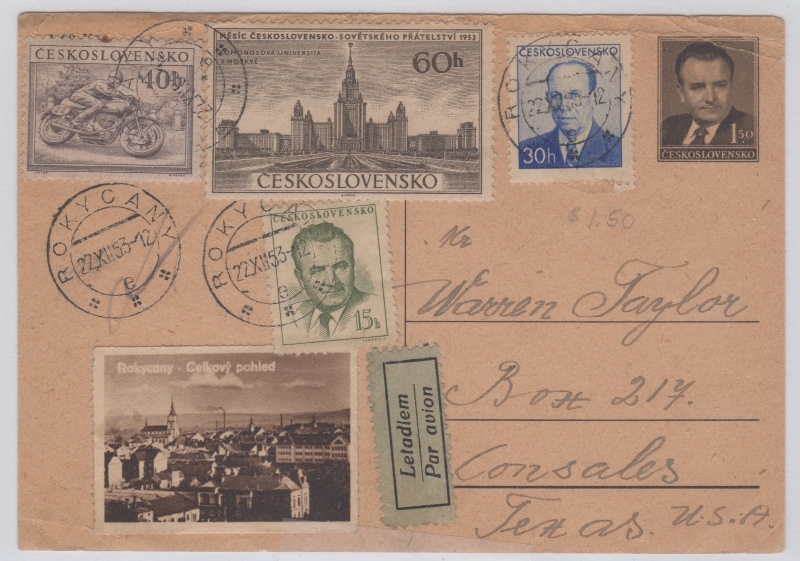 Comes with a nice label featuring a view of the town (Rokycany) that this card was mailed from. An interesting cover for my collection that revealed an interesting story about the effect of the currency reform. Florian (on StampBoards) also linked to some really great exhibits showcasing covers from the era of June 1st through June 19th when old stamps were used at a currency exchange rate of 50:1.